Fun Facts: Rabbit or Hare? Hares and rabbits are similar looking and some people may “jump” to the conclusion that they are the same! However, hares and rabbits are from the same family, Leporidae, but they belong to different species! Hares are generally larger and faster than rabbits, with longer ears, larger feet and black markings on their fur. While both hares and rabbits molt and grow new hair in the spring and fall, hares living in snowy regions turn white in the winter whereas rabbits do not. A hare's pregnancy lasts 42 days and the young are born covered with hair and open eyes. The newborn hares are called leverets and are precocial, which means the newborn is fully developed at birth. Hares don’t have nests - they spread their leverets out over an area, leaving them alone to hide. Baby hares have no scent, are well camouflaged, and ‘freeze’ when danger is near, making them nearly invisible to predators. Mom comes by only at dusk and at dawn to feed them. If you find a baby hare, leave it right there! Many people who come across baby hares in their yards or nearby parks think they are orphaned, but that is not the case! Adults rely on their speed for protection from predators. Their diet consists of buds, small twigs and shoots. These animals are not social, in fact they spend most of their lives alone and come together in pairs only during mating. Have you ever heard the saying “They breed like rabbits?” This saying refers to the rabbit’s 30-31 day pregnancy period, meaning they can reproduce very quickly! In fact, they can have 4-8 litters each year! Newborn rabbits are called kits and are altricial, meaning they are born with their eyes closed, hairless, and without the ability to regulate their own temperature. Rabbits molt like hares, but their brown summer fur is typically replaced by a grey for the winter. 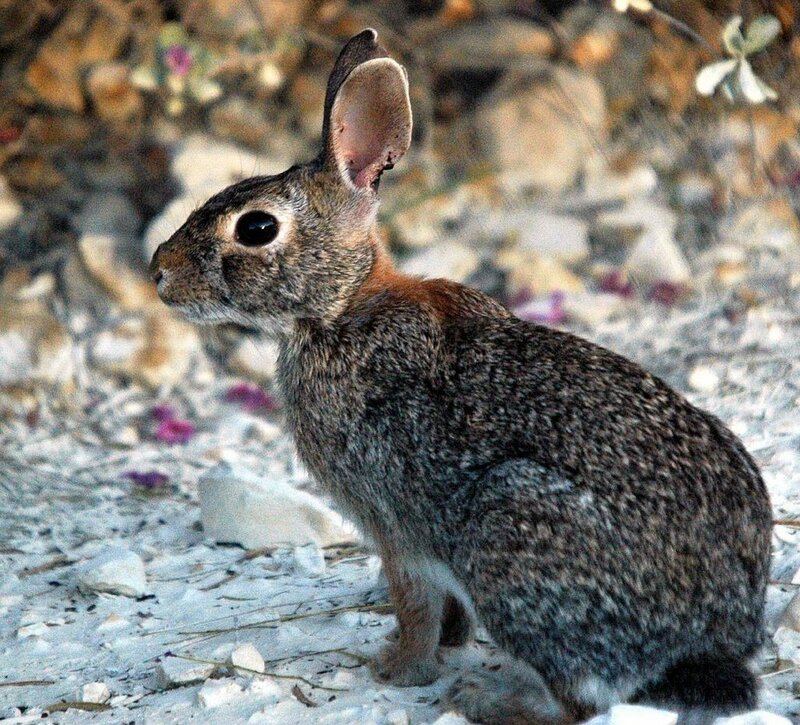 Rabbits live underground in burrows, which is also where they have their litters. They are much more social animals than hares, living in colonies and even fighting each other for mating rights. Male rabbits will fight other males in the group and the winner will mate with most of the females in the colony. Did you know that rabbits’ and hares’ eyes are positioned on the sides of their head, so they can see behind them without turning around!? Good luck sneaking up on one of these guys!